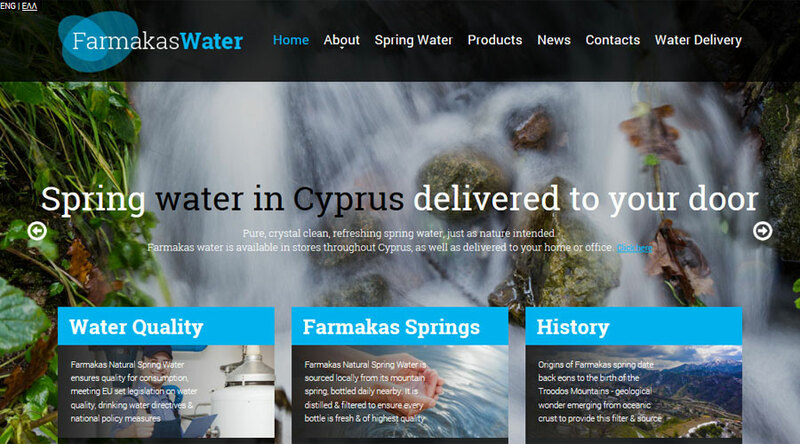 Website Project: ASA Farmakas Natural Table Water provides a range of natural spring water related products to the Cyprus market, both in-house brands, as well as associated labels for partners, sourced from the mountains of Farmakas in the Troodos range, Cyprus. The client required a new website to help support their expansion in the Cyprus market. Focus of this project was to deliver a modern, dynamic-looking website, that is also fully responsive (i.e. adaptable to mobile phones and tablet devices). Partly to support business-to-business interactions and sales, and partly to help enhance consumer brand awareness in the Cyprus market - to locals and tourists alike. To achieve this, the website had to be attractive, take into consideration user navigational experience (UX website design), and offer rich content on the client's products as well as the health benefits of drinking natural spring water. This would in turn help boost overall online presence. A fully custom-built Content Management Solution (CMS) has been integrated to the website's frontend infrastructure, allowing the clientto maintain the content of their news and promotion pages. This then allows the FarmakasWater.com website to be both flexible during the company's growth and development, whilst maintaining strong online presence. These web development services are complimented by an overall digital communication strategy and direction on best practices in using the CMS platform together with various relevant online communications channels. No doubt, this website has quickly become the leading website for a natural spring water brand in all of Cyprus, and indeed rivals most other international water brands. It is ultra modern, easy to navigate, and enjoyable to read. The Farmakas Water brand will no doubt enjoy significant added exposure and in turn value, whilst helping to increase product sales.